If you’ve suffered an injury while cycling, you may be entitled to compensation. Cycling is an easy and environmentally safe way to get around the city. In this day and age with gas prices skyrocketing and traffic gridlocks becoming a daily occurrence, biking to work or while running errands provides the user a convenient and healthy way to go about completing business. However, cyclists are often subjected to hit-and-runs, illegal driving practices, serious injuries, and property damage. Cyclists don’t have the advantage of being encased in two tons of protective technology like drivers. Yet insurance companies regularly try to pay victims of bicycle accident injuries an unfair amount. If this has happened to you or a loved one, you should speak with a Houston attorney who specializes in cycling accident injury cases. We offer a free consultation where we’ll meet with you to discuss the type of collision that occurred, as well as you legal rights and remedies. The statistics are downright sobering when it comes to the figures that our bike accident law firm fights so hard to combat. 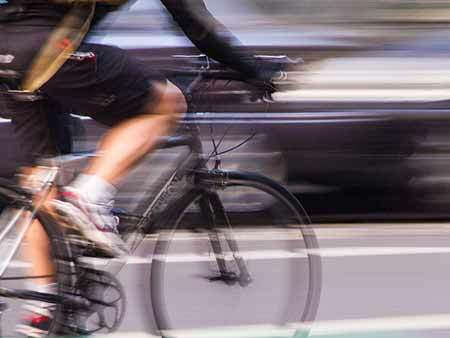 Every six hours, a bicyclist is struck and fatally injured by a motor vehicle driver. An outrageous one million accidents between cars and bicycles involves children, with half of all bicycling fatalities occurring to kids under the age of 16. Head injuries, one of the most difficult classes of injuries to recover from, account for 75% of the damages left behind after a careless driver harms an innocent biker. Recently, the cultural trend seems to be moving towards making accommodations for cyclists and encouraging this method of transportation. All parks and recreational areas are now equipped with bike trails, and most city-wide streets have had bike lanes constructed for people to use. Some cars are now even becoming equipped with bike racks for easier transport. However, the aggressive mentality of some drivers and the concept that a car can trump all laws pertaining to pedestrians and bicyclists are responsible for many inexcusable deaths in America on a yearly basis. If you or a loved one has suffered persona injury due to a third party’s involvement in a biking accident, contact a Sutliff & Stout as soon as possible to learn your rights.